Look what we found in the backyard early in the morning! Mr. Mallard and his wife –she’s hiding behind him. the perfect Easter week visitors. Ok, maybe they came from down the street at Utah Lake, but it’s fun to think about. I love that they choose our yard for a rest stop. Come back soon guys. You’re welcome to eat our bugs anytime! And I don’t say that to just anyone! You should look on my blog for what was going on in my yard that same misty morning! I wish I would have seen them! How fun to have such unexpected visitors! 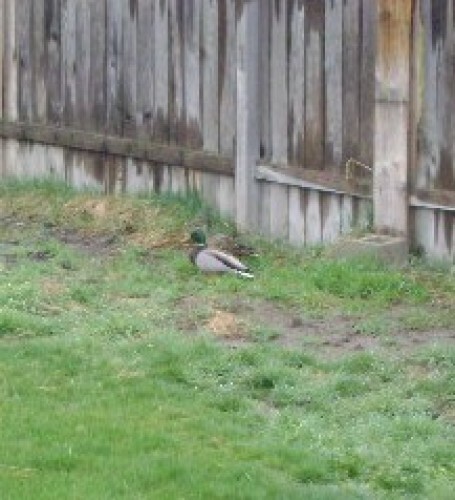 We have a pair of ducks that take a mini vacation each spring & fall in our backyard swimming pool. They’ve done it every year since we have lived here. Since spring comes earlier to southern California, our ducks came & went back in February. Kim–that is so cool. We used to have domestic ducks in our backyard that we bought at the feed store, but they couldn’t fly. Well, at least they didn’t fly. I hope these guys make it a regular stop–like yours do.